Georgia on my Mind | Marbella Marbella – Adelante! Georgia is a fascinating country with a unique mix of civilisations. It is the same area as Andalucia with less than five million inhabitants who are unrelated to Russians, Turks or Persians. Actually the Georgians have more in common genetically with the Basques and Corsicans than with any other races. The religion is orthodox Christian and their traditions include a sense of hospitality and a code of honour that occurs in few other countries. A person is judged by the strength of his friendships. Here on the Coast there are not many Georgians, about 50 apparently, including the royal family. 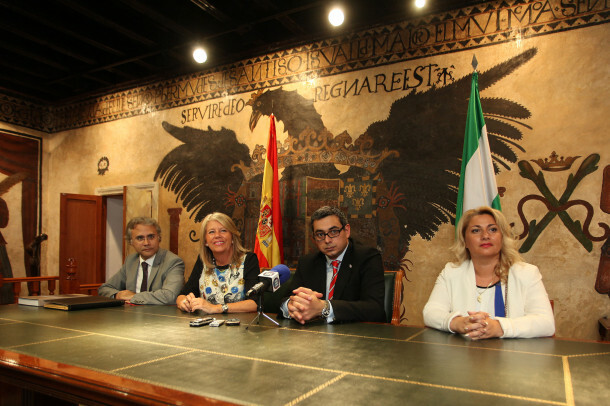 Recently the minister of the presidency, Andro Barnovi, spent a few days in Marbella, which happens to be twinned with the resort town of Batumi, and is also where the Georgian-Andalucian Chamber of Commerce is headquartered (www.gcciandalucia.com). He spent time visiting nearby wineries as Georgia plans to establish an international wine academy. Few countries can claim to have a history going back so far in respect of winemaking, and archaeological remains dating back to 8,000 BC have been found. Most houses in the wine regions make wine for private consumption, but the way they make it is like they did in Spain in the 50s. There are however some excellent products made commercially for export, although it is clear that there is still some way to go before being able to compete with Spanish and Italian wines. The brandy is another matter, and Georgian coñac and armagnac is justly famous worldwide. The frequent wine wars with Russia always make news, and since this is the country’s main export to its northern neighbour, Russia can exert pressure by limiting or stopping imports, such action having a disastrous effect on a large part of the Georgian economy. Georgia today has much in common with Spain as it left behind the hangover of the civil war and began opening up as a tourist destination and a commercial power. There are neither motorways nor regional airports and the trains tend to be on the slow side. To fly there usually involves going via Turkey and takes time. The new government, elected last weekend, plans to address all these matters promptly, but in any event the richness of the country as distinguished by its people, the scenery and the gastronomy, makes it inimitable and exciting.